I am back and exhausted, house is hot and a little stinky from cat food. Cats are fine. I am fine. Did NOT win Daphne or National Readers' Choice awards, but had excellent meetings, saw wonderful friends. Stopped by Meteor Crater and took 119 pics of the place I'm thinking is the Great Labyrinth in the Heart books, more on that (ad nauseum no doubt) later. I am okay. I have been known to go to Midnight showings but Aurora is east of me and not somewhere I'd usually be. My heart is sad and my best wishes go out to all the lost and the survivors and their families and friends. 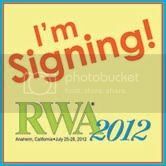 A copy of the wallet calendar I'll be handing out (and putting in the goodie room) at the RWA conference. I'll also be at the free books Berkley/NAL signing (for conference attendees) on Saturday morning. I'll hear how Enchanted No More does in the National Readers Choice Awards, and Heart Search in the Daphne's. I am rooming with someone who offered me space in her room and I'm sure I'll make a new friend. All my past roommates (whom I actually keep up with, or they keep up with me), have been stellar. May you enjoy the anticipation of a treat today...(like maybe Heart Secret on August 7)? All right folks. I'm writing Glyssa Licorice's story -- the librarian. That's her main Flair, doing research, organizing materials, ferreting out details, putting together materials for others' needs. In any event, I need a secondary creative Flair for her. I've used a lot before: embroidery, flower-drying-arranging, etc. Currently she is at the camp of the excavation of Lugh's Spear in the eastern part of the continent (map on pinterest). I don't know that her talent necessarily needs to be portable. It MUST NOT be WRITING. Hmmm, just had a thought. What do you all think of beading? Her HeartMate's talent is leather working and tooling. But if anyone else has a better idea, there's an ARC of Heart Secret for you. In any event, as I plinked at the manuscript this morning, fine-tuning, I realized I'd reached that point where, except for one bit, I didn't know whether I was making it better or just different. That's absolutely the time to quit editing. I'll give it another pass when I get the copy edits, but now I will try to forget it so I can look at it with fresher eyes. May you have good news today. In any event, I worked on contest entries this week and revision (which included new words). May you have an excellent weekend and the following week. Yes, the next couple of weeks I will be preoccupied with going to Anaheim (on a road trip). WE ARE NOT GOING TO BE ALPHABETICAL THIS YEAR! IF YOU NEED A MAP PLEASE EMAIL ME. Today I will be revising 3 projects: my epub Wild at Heart; Heart Fortune Chapter 1-2, and, Enchanted Ever After, they went out to one beta reader before I send them to my editor. I don't usually work on more than one project in a day, but if I want to produce more, and produce novellas for epubbing, I think this must happen.